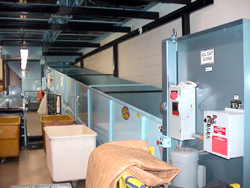 Gardner Soil Monorail Storage Conveyors increase storage capacity by storing an adequate amount of soiled goods in slings on an overhead monorail system. The operator pushes a button to select the proper rail for storage of soiled articles (classified or unclassified), a lift moves the sling from the cart to the high position, and the sling then rolls by gravity to the pre-selected storage rail overhead. 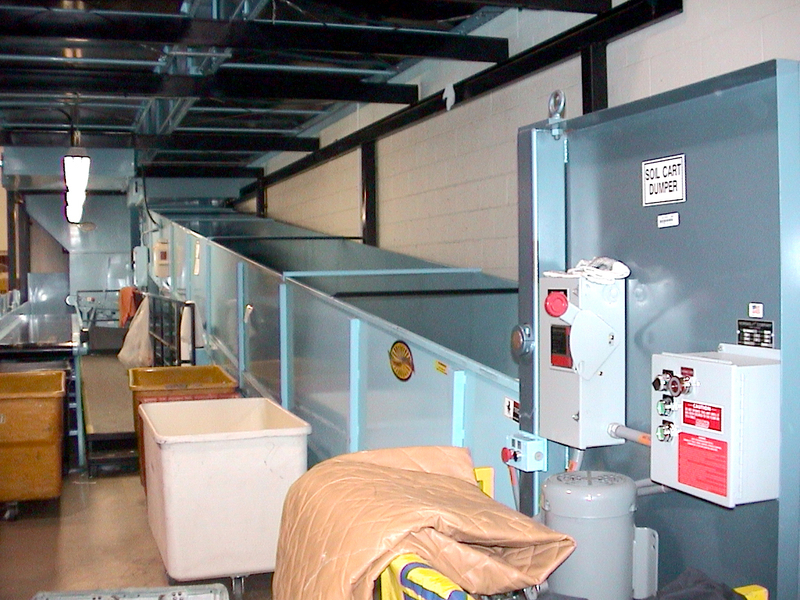 These conveyors can allow for pre-staging prior to sorting to reduce the handling of the goods, eliminate unnecessary movement of carts, and allow rapid turn-around of carts. Washers are unloaded into sling-lined carts. The slings are then sent by the push of a button to storage overhead to a pre-selected rail either for ironers, dryers, garment finishers, or other classification. Operators can then push a button at a processing station to receive delivery of goods automatically from the appropriate rail.